The KCF Safe Touch heater is intended for areas that are required to have surface temperatures below 125 degrees F. These areas are typically, day care centers, memory care centers, common areas where wheel chair patients may be placed or anywhere a temperature of an electric heater over 125 degrees could cause someone to accidentally burn themselves over time. 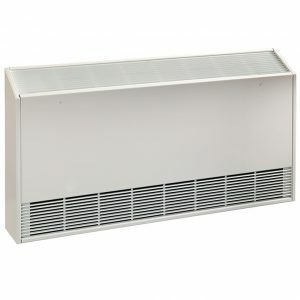 Many older care centers have implemented this type of heater replacing the old style high wattage baseboards as it has been enforced by inspectors and required by code to keep their patients safe. Heavy duty front covers and our Ceramic Core heating element makes this a long lasting heater with virtually no maintenance required. 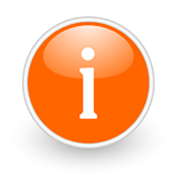 Optional: Sub-base for mounting close to the floor, inbuilt thermostat factory or tamper-proof thermostat may be installed. 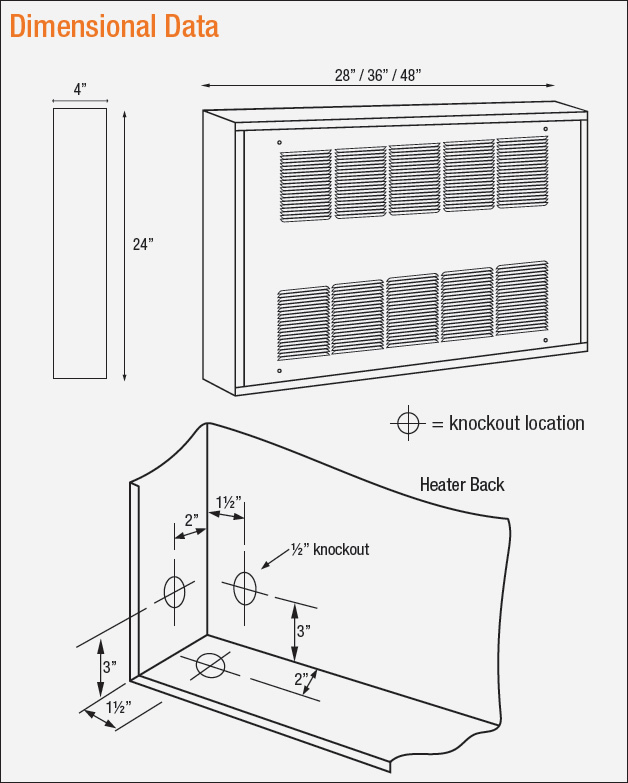 Heaters can be ganged together to work on one thermostat if higher output is required. Not for residential use unless the manual reset option is added. Ideal for day care centers, memory care centers, common areas where wheel chair patients may be placed or anywhere a temperature of an electric heater over 125 degrees could cause someone to accidentally burn themselves over time. 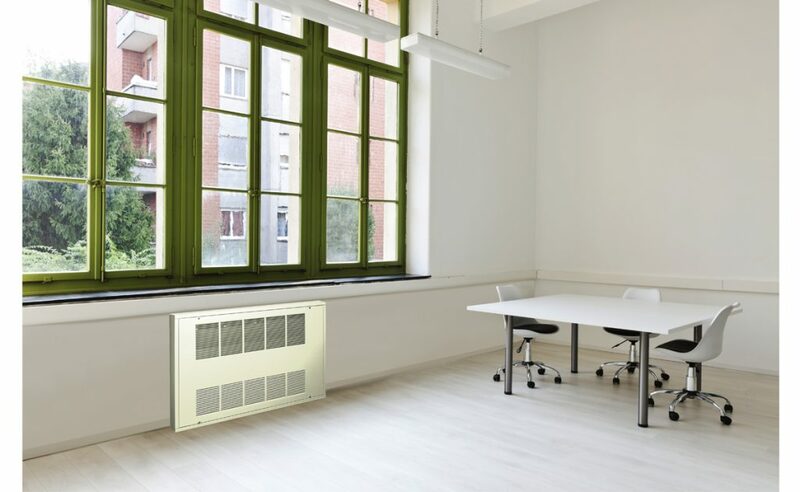 Designed for large commercial spaces, using natural convection in an architectural design which is perfect for areas requiring lots of heat without fan noise. * Refer to KCF for dimensions, control options, mounting data. 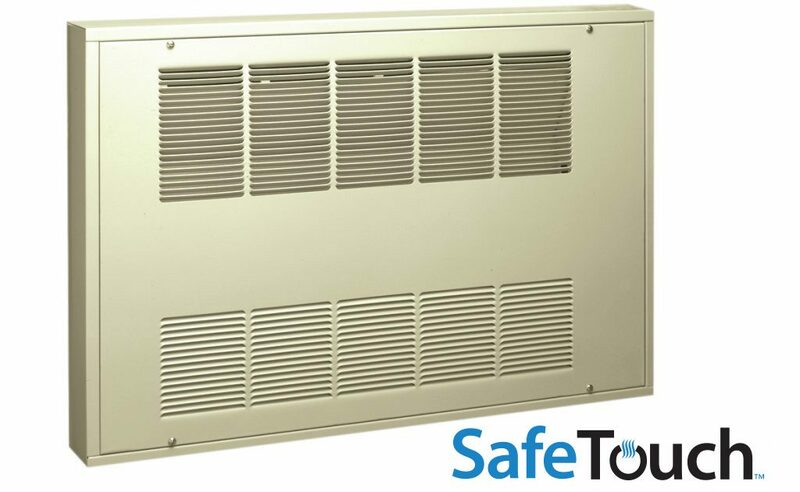 Contractor shall supply and install KCF Series Safe Touch cabinet heaters manufactured by King Electrical Mfg. Company. Heaters shall be of the wattage and voltage as indicated on the plans. Construction: Heaters shall be constructed in 18 gauge galvanized Steel with epoxy powder-coated manufacturer’s standard finish. 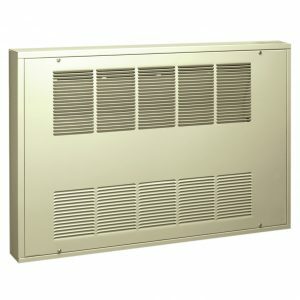 A louvered front cover with intake and outlet grille will protect element area and provide ample air flow to dissipate heated air. Element: The superior performance comes from the proven technology of the ceramic thermal storage heater core. A 7/8″ diameter aluminum tube is filled with a special high density ceramic that stores the thermal energy. The oversized fins (4.875 in2) are made from durable (0.015″thick) high grade aluminum which produces better heat transfer than other elements. The benefit of the technology comes when the thermostat is turned off and the element continues to radiate heat. It also reduces temperature swings by heating and cooling more evenly. A fired refractory ceramic core with two large diameter Nickel Chromium coils attached with high temperature stainless connectors and stranded Nickel wire, terminated in a junctionbox. Controls: A built-in thermal cutout shall automatically shut off the heater in case of overheating. A built-in thermostat for temperature control will have a range from 40°- 95°F and be of the high accuracy capillary tube-type. Disconnect switch and contactors will be provided if necessary. Blower and Motor: Up to 3 tangential cylindrical blowers, delivering 70 CFM each, shall be driven by a shaded pole, permanently lubricated, C-frame type motor with impedance protection and sealed bearings. Motors shall be the same voltage as the heater. All 480V units use 277V motors and contactors. This requires a neutral connection.